First shave this morning...been looking for something more efficient and boy did this deliver ...was a bit nervous so only did a 2 pass shave ...best 2 pass shave ever. Looks very nice with that handle. I wish they would make that head in stainless steel. Had to comment on my third shave this morning...inserted a new Polsilver blade which were sent with the razor pushed the razor to a modified 3 pass approach wtg/xtg biased to wtg/xtg biased to atg..and some touchups ...this is only the 4thDE I have really used so take my comment with a grain of salt but it was literally my best shave ever...I have alot of razors incoming to test but am blown away by this razor and am now committed to trying it out as a daily driver. Nice shot! I am glad that the razor is working well for you. 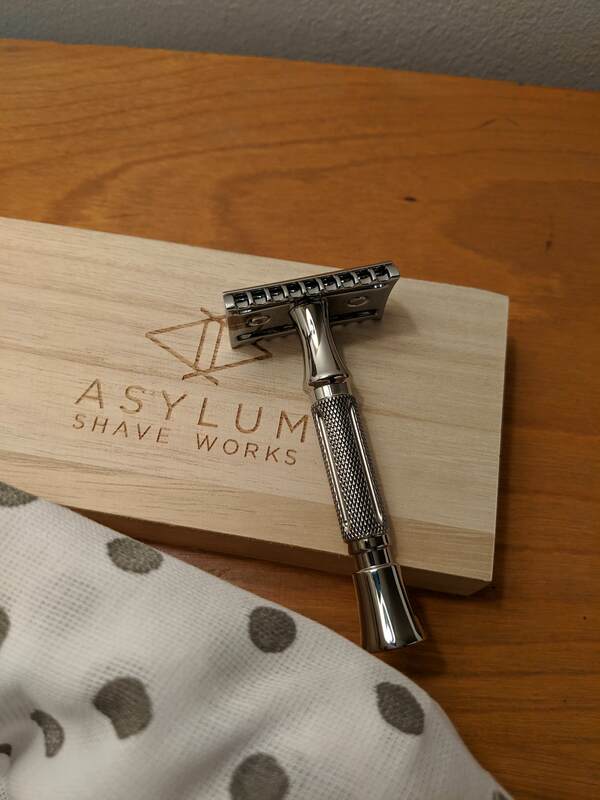 (11-26-2018, 05:10 AM)OhCanada Wrote: Had to comment on my third shave this morning...and am now committed to trying it out as a daily driver. You may want to re-think that idea. Trying to be ambitious, but after the 3rd shave in a row, and the arrival of a Dart already has me rethinking it ... . 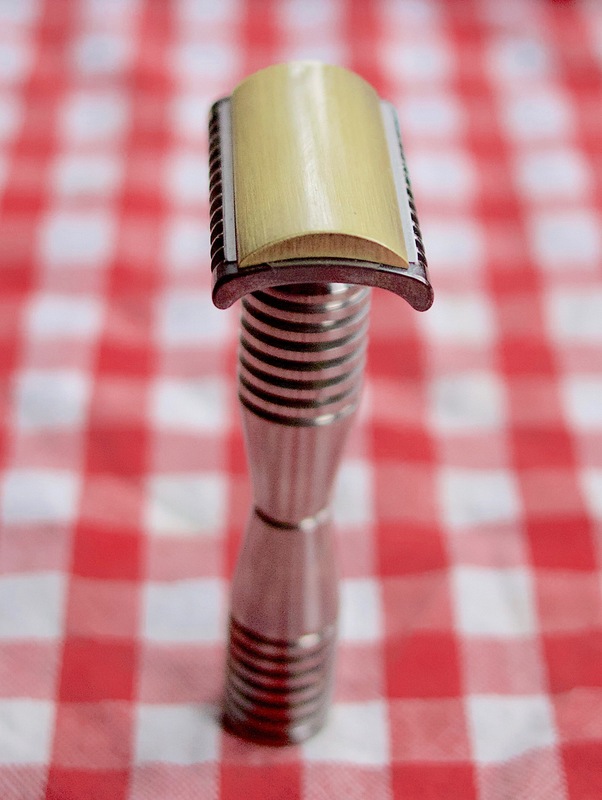 This will definitely be my Monday morning shaver, with a newborn I rarely take the time to get a close shave over the weekend, so this will work out great. I would be interested to hear your Dart vs R1 comparison. I think it's great you've found your best shaver so far. The search is great fun! The Asylum handle is wonderful. Great weight and balance with every head I've had it paired. Right now it's mated to an ikon B1 OSS. What a sweet combination! Enjoy your shaves. (12-04-2018, 08:32 AM)Sharps Wrote: I would be interested to hear your Dart vs R1 comparison. and a base that will allow it to stand upright. A very good design, in my opinion. I wonder how well it would match with the Blackland Vector head? If it was available in a machined finish, I would try it, as I don't much like the Vector handle. As for the Mühle R41 head; no thank you. Try a Gillette 7 o'clock (black) blade, their coated and may lend a little protection to an aggressive razor. My R41 is somewhere collecting dust, but I'm glad your enjoying yours, especially as a daily shaver. (12-07-2018, 01:18 PM)Sliver630 Wrote: Try a Gillette 7 o'clock (black) blade, their coated and may lend a little protection to an aggressive razor. My R41 is somewhere collecting dust, but I'm glad your enjoying yours, especially as a daily shaver. Nacet might have been brutal in a Dart, but it worked beautifully for me in my R41. I also changed the handle, in this case to a titanium handle 85x16mm, 53g. Shown here with my Fatip head and Yintal Bronze top cap. Boy, that handle really looks amazing! I also bought one of these razor because of this thread! Also bought the Colonia Soap and AS! I must say that the handle is absolutely astonishing. It look awesome and it is really well made. It is a bit smaller then I expected based on the photo I saw, but it is in no way too small for me to use. I really like the vintage look it have. And it fit the bottom plate of the R41 perfectly. The soap and AS is truly a must have. The scent is just phenomenal. I have used it two day in a row when I received it and I don't remember the last time I used the same soap 2 consecutive day. The liquid balm is something special, really soothing and I still can smelled the scent several hours after application. Glad I bought these, will probably look to try a paradigm Titanium eventually! 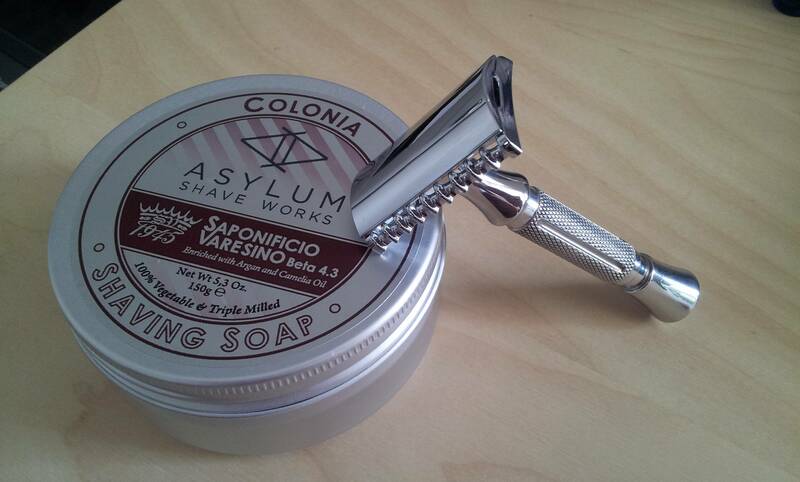 If you like efficient razor, this Asylum 41 is a must! Congrats ...it is a great razor.